The Ember 2’s radio system has already been bound and everything you need to get started is included in the box, even the batteries. After installing the AA batteries in the charger, simply charge the flight battery (which takes approximately 20 minutes) and you’ll soon be enjoying a micro experience highlighted by extended flight times and maximum performance, along with the ability to perform 3-channel aerobatics sure to put a smile on your face. 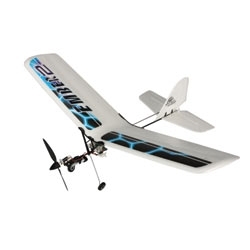 From sharp looks to instant enjoyment, the Ember 2 delivers on everything you’ve grown to love about ParkZone® products and their unique niche in the world of ultra-lightweight aircraft. Tiny, slow, and lots of fun—you’re sure to get big enjoyment from the Ember 2.